Fresh, crunchy, sweet, just enough saltiness, tangy, a wee bit chilli, aromatic. Wondering if I am practising my adjectives? Well, you would too if you had these delicious lettuce cups. I first had this delicious treat when my kaki made them at her home. Since then I’ve had them in many Chinese restaurants. They are an exciting starter for vegetarians. Call them cups or wraps, whatever you like. Let your imagination run riot and add whatever ingredients you want right from vegetables to meat. Lettuce cups are good as starters or an innovative salad dish too. I prefer to use the iceberg lettuce but feel free to use chinese cabbage if you get some. You can chop the vegetables and prepare the lettuce and dressing well ahead and keep it in the fridge. Mix the ingredients for the dressing in another bowl. 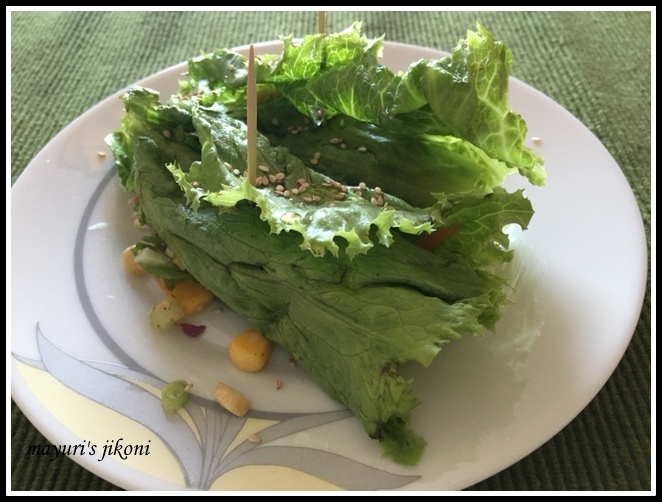 Put the lettuce leaves in a plate or a bowl. Your guests can help themselves by spooning a bit of the filling and dressing into the lettuce leaf. Fold and eat. If the lettuce leaves are not crunchy, soak them for a while in ice cold water. Then drain out the water, pat dry the leaves with a clean cloth and serve. Can add 1 tbsp soy sauce if you like. Reduce the amount of salt. Try using chines lettuce, it tastes great. Can add finely chopped green chilli instead of chilli flakes. Don’t add the dressing to the filling as it will become watery. Top the filling on the lettuce leaf with the dressing before eating.